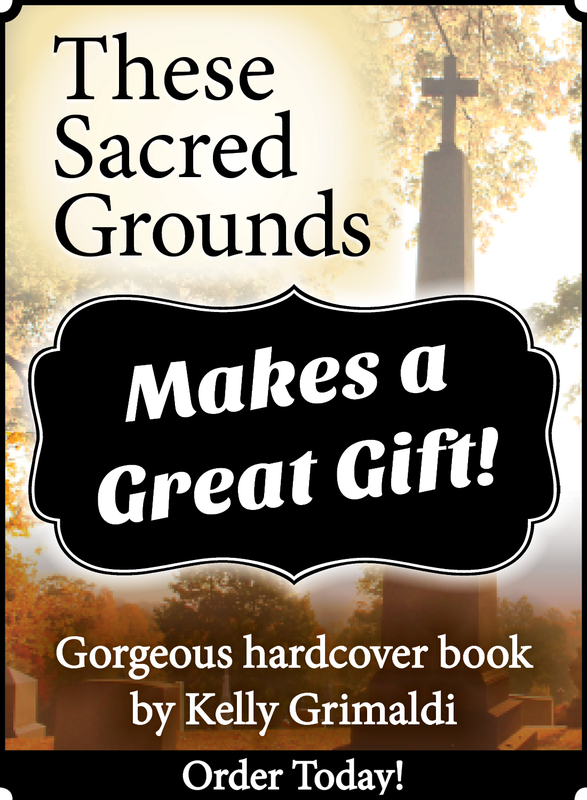 Our book “These Sacred Grounds- Celebrating 150 Years of St. Agnes Cemetery” on sale now! 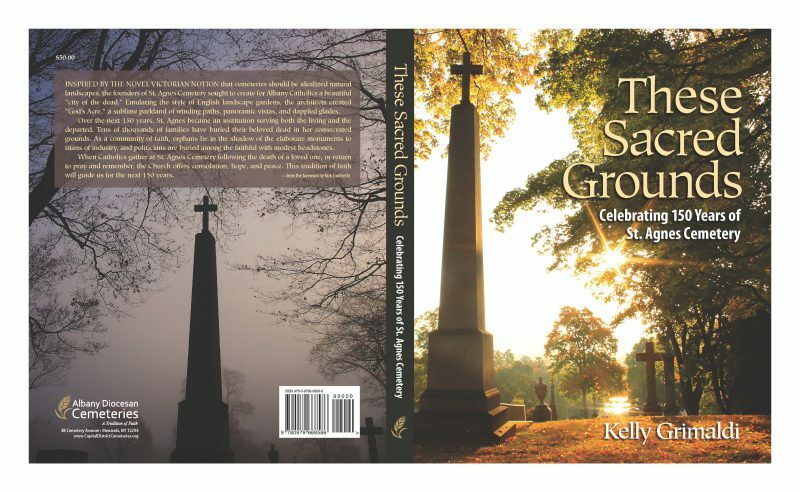 A beautiful 160 page coffee table book “These Sacred Grounds: 150 Years of St. Agnes Cemetery” by Historian and Author Kelly Grimaldi is now on sale for only $35. The book takes the reader on a journey from the Victorian era into modernity and brings to life captains of industry, war veterans, artists, a famous movie star, politicians, tragic deaths and so much more. The wealthiest citizens gave us much to admire with their stately burial lots but the ordinary citizens and the poor played an important part in the shaping of history and their modest graves tell their own story. Sometimes these stories are sad stories of high infant mortality; tragic workplace accidents; ravaging infectious diseases; and some are stories of triumph, inspiration, perseverance and success. Today each memorial provides us with a lesson in art and in history that we explore within the book. The Honorable John (Jack) McEneny, a well-known public figure and local historian, contributed a feature story for the book. The descendants of prominent families, Dr. Kathleen Quinn, Vincent J. Forte, Jr., and Dr. Joseph Meany also wrote very insightful pieces about their ancestors. Photographs by Mick Hales, Jennifer Mele, Chuck Miller, Jeannie Keefe, along with community members who participated in the St. Agnes Photography Contest, 2009-2013, provide a splendid pictorial narrative. Images rich in color and detail are featured on nearly every page of the book highlighting the history, art and landscape of beautifully sculptured memorials large and small, stained glass, and neo-classical to contemporary architecture memorializing people resting in these sacred grounds. In the Victorian era, lot owners of all socio-economic means took great pride in creating sacred grave spaces. Over the years, burial practices have changed and the landscape of St. Agnes Cemetery reflects those changes in its funerary art and architecture that fill its 114 acres. Large, ornate family grave lots with neo-classically designed mausoleums and memorials gave way to smaller lots with respectable monuments more uniform in size and bronze markers in shrine sections. Additionally two beautiful Community mausoleums bathe thousands of individual crypts and cremation niches in natural light while protecting the remains of those entombed or inurned within the polished marble walls. Since its opening in 1867, St. Agnes Cemetery located in Menands, New York has served its community with compassion and love following closely the doctrine of the Catholic faith and customs surrounding the death and burial of the faithful. In this present day the Cemetery continues its ministry to pray for the dead and provide comfort for mourners in service to hundreds of families every year. 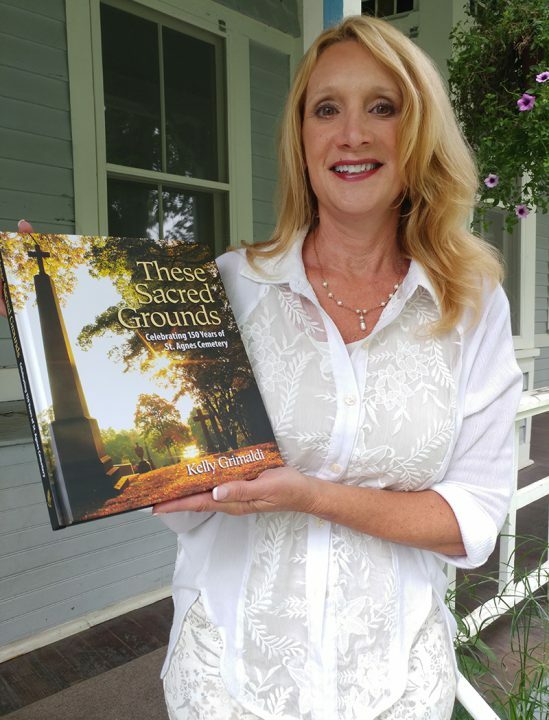 Proceeds from the event and book directly benefit the cemetery and help ensure Historic St. Agnes Cemetery will remain well kept and safe for future generations. To order book(s), click here to download our book order form. Businessman Anthony Brady became one of the wealthiest men in the world in the late 1800s. “He was one of the first businessmen to capitalize on the in­vention of electricity, having locked in a contract in 1881 to light the streets of Albany,” Ms. Grimaldi writes in the book. Brady’s name may also be familiar because he founded the Brady Maternity Hospital in Albany, now home to the Pastoral Center where diocesan offices are located. When he died in 1913, he was entombed at St. Agnes Cemetery in a massive, Greek Parthenon-style mausoleum that’s worth about $4 million today. A tragic example is that of the orphans of St. Joseph’s Industrial School in Albany. When 14 girls from the school went into Fernwood Pond on a hot summer day in 1903, watched over by Sisters of Charity, several girls fell off a raft into a 17-foot-deep part of the pond. None could swim and rescue efforts failed. Read the complete Evangelist article here. Read an article that The Times Union published about the 150th Anniversary and book release. Would it be possible to have book autographed bu Kelly if I stop down sometime today?